Ronald S. Lauder: "This man is not a suitable partner for religious dialogue"
The head of the World Jewish Congress has expressed outrage at the decision of five Christian groups to host Iranian President Mahmoud Ahmadinejad at a dinner in New York. The Mennonite Central Committee, the Quaker United Nations Office, the World Council of Churches, Religions for Peace and the American Friends Service Committee are sponsoring a dinner on 25 September 2008 with Ahmadinejad as the guest of honor, an event described as "dialogue between religious and political leaders" and a conversation to discuss "building peaceful societies". Ronald S. Lauder, president of the World Jewish Congress, said: "These organizations, who present themselves as altruistic and who have global influence, are promoting the world's foremost supporter of terrorism and an egregious violator of human rights. It was Ahmadinejad who held the first-ever state-sponsored international conference of Holocaust deniers. It is Ahmadinejad who is posing a threat to the United States and to Europe, and who has repeatedly called for the annihilation of Israel. It is Ahmadinejad who is defying the United Nations Charter with his mistreatment of minorities and women, and violates the UN Genocide Convention by threatening the destruction of another member state. It is Ahmadinejad who is steadfastly ignoring UN Security Council resolutions and who continually lies to the International Atomic Energy Agency about the real intentions of his nuclear program, endangering not only his neighbors in the Middle East but the entire world. Such a man cannot be a partner for peace and inter-faith dialogue." Lauder added: "These groups, who claim to hold up values such as peace and mutual understanding, make a mockery of themselves by shamelessly providing a cruel dictator and racist with a platform for his invective. There is no purpose in dignifying him. The World Council of Churches, the Quakers and the other sponsors of the event in New York have a long and distressing record of demonizing Israel. With their bow to Ahmadinejad, they have brazenly chosen a racist dictator as their friend." The WJC president also criticized the participation at the dinner of the UN General Assembly's current president, the former Nicaraguan foreign minister and Catholic priest Miguel D'Escoto Brockmann. "Instead of showing a united face against Ahmadinejad, Mr. D'Escoto honors a man who does great dishonor to the United Nations. 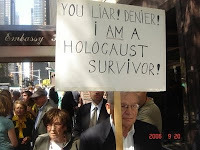 That is shameful and puts the credibility of the UN vis-a-vis Iran in doubt," Ronald S. Lauder pointed out. Here's a good article on this important meeting - http://www.religionnews.com/index.php?/rnstext/pacifist_churches_under_fire_for_ahmadinejad_dinner/. "Jesus ate with lepers and with tax collectors, and in the United States right now, Iran would be in that category," says Arli Klassen, executive director of the Mennonite Central Committee, an outreach arm for Mennonite and Brethren in Christ churches in the United States and Canada. "The criticisms levied at Jesus were that he ate with ... people of ill repute, and we're getting similar criticisms." "You can't just engage with people with whom you agree on all issues," Graham says. "That leads to a very myopic view of the world. And you miss a lot of opportunities with that approach." Thank you MCC for having the courage to work at peacemaking even when it's not popular!